Feel free to press pause if you like. Our Wedding on the 18th January 2000. A bit about me......I was born on the 30th July 1951 & it apparently snowed the day I was born. I was below 6lbs when I was bought home from hospital, but I never looked back weight wise from there on in. I went to Glenroy State Primary School for a couple of years then on to Glenroy West Primary School & then on to Glenroy High School. I finished my schooling there and thought I knew it all and I was now an adult!! I worked at Hilton Hosiery in Richmond in my first job. I worked in the laboratory on quality assurance and studied dye chemistry. From the laboratory we worked out the formulas for the dye house. Was an exciting time having just left school and embarking into the adult world of life. My Children..... Kerry was born on the 30th April 1972 & Craig was born on the 26th September 1978. What an amazing experience child birth is, something that you never forget. The miracle of birth & survival, it continues to amaze me to this day. My Grandchildren.... Alex was the first grandchild....born on 15/10/1993. This is the anniversary of my dad's death. At first I dreaded it would be that date, then as my mum had only passed away on the 6th October, a week before Alex was born, I thought on the day....a life for a life.... Neither of my parents got to see any of my grandchildren and that is sad, but can't be changed, so I believe that they look on them from above. Jade came next on the 25th June 1997. The only girl amongst so many boys, and what a stunner she is. Craig was next on the 23rd March 1998. The cord was around his neck when he was born and we feared the worst at first as he was so very blue in colour, but everything was okay. Now he is more likely to be black & blue because of the stunts he performs on his skateboard! Ryan came along in 2000. He was born on the 2nd April 2000. He is shooting up so fast he needs a brick on his head. James was next on the 3rd August 2000, but he decided life with us was not on his agenda and he slipped away on the 5th November, 2000. He lived only 3 months and 2 days & he died from Sids. Sudden Infant death Syndrome. In other words there is no known cause of death. Nate was born on the 16th September 2003, and he is such a deep thinker. The last but not least, Jackie on the 12th February 2004, he likes to know the ins & outs of everything, and has a very inquisitive mind. 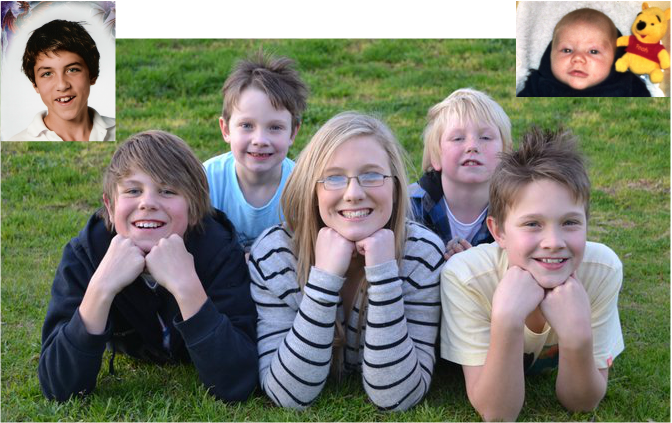 I have seven beautiful grandchildren, one just happens to not be with us here in the physical, but I still have seven. Alex, top left. James top right. Bott L to R. Craigie, Jade & Ryan Top Row L to R. Jackie & Nate.